As the University of Utah Prepares to face TCU in one of the most important football games in school history, we look back to the evolution from coming up short in the 1980s to flirting with superiority in 2010. When No. 5 University of Utah lines up to face No. 3 Texas Christian University on Saturday afternoon in Salt Lake City, the stakes will have never been higher for either team. The winner stands to firmly entrench itself near the apex of college football rankings and could have at least an outside shot at playing for the BCS Championship. Utah has never been ranked higher during regular season play and Utes fans are already in a frenzy, impatiently counting down the minutes to the kickoff of what is already being called the most important regular season game in school history. Saturday’s faceoff will feature two evenly-matched teams that have both dominated the Mountain West Conference for the past several years. TCU is a defensive powerhouse, allowing only 217 yards per game and good enough for NCAA’s top spot in that category. Utah has the third-highest scoring offense in the country, averaging more than 45 points a game. Granted, both teams’ schedules have not featured many tough opponents, so you can throw these stats out the window. Utah QB Jordan Wynn will need to deliver a clutch performance to defeat TCU on Saturday. The key to the game will be whether Utah’s defense can slow TCU long enough for sophomore quarterback Jordan Wynn and the Ute offense to get on track. Outcomes are always uncertain and this game could easily go both ways. What is certain, however, is that this game is absolutely HUGE. For both teams. Should Utah win, they could (potentially) ascend to an unimaginable height that no longtime Utes fan ever fathomed: a (potential) legitimate shot for a National Championship. They also have the rare chance to go on their own Crusade of sorts by defeating football teams from religious institutions in three of their next four games (Texas Christian, Notre Dame and Brigham Young). But to really understand what this season and the previous undefeated campaigns in 2004 and 2008 means, you have to look at the history of gut-wrenching defeat that defined Utah Football for decades to truly appreciate the current position of Ute players and fans. In an attempt to relax my nerves for the big game on Saturday and look at it from a big-picture perspective, I took a trip down memory lane to the days when simply beating rival BYU made the season a success; moving to the 1990s, when getting an invitation to a bowl game was a giant step; and onto the new millennium, where Utah has ascended to heights I could never have imagined. So before we fully focus on beating TCU and the potential glistening shores that we face—and have frequented in recent years—let’s gaze back upon the black-water morass and revisit the rise to where we sit today. Utah Football has endured a long journey to reach this unprecedented peak, emerging from a sea of mediocrity that once engulfed the program for decades. This perspective is lost on newer fans, who have come to expect excellence every year from the boys in crimson. The same can be said for the bandwagon contingent as well, whose fair-weather fandom and ignorance of the agony that traditionally accompanies watching the Utes does not allow the pure sweetness of the modern incarnation Utah Football to fully absorb onto the palate. Being a Utah fan was not always easy. For many of us, the crest of the wave we currently ride was born from the treachery of dark, stormy seas. My early memories of attending University of Utah football games involve the horrendous clanking of cowbells from visiting Wyoming fans as their ‘Pokes rampaged our home field. Halftime shows of Air Force’s peregrine falcon soaring fiercely through the air only meant that their football team was currently in the locker room after doing the same thing to our defense on the ground. We even lost regularly to New Mexico, UTEP and Colorado State, for hell’s sake! Many highlights of going to games weren’t often derived from looking at the scoreboard. Sometimes, the only satisfaction we Ute fans gained was drilling BYU mascot Cosmo the Cougar squarely in his oversized, stuffed feline face with hard-packed snowballs (to which my brothers and I can proudly attest). Skies were overcast on the brisk autumn afternoon of November 19, 1988 when the University of Utah Utes emerged from their locker room ready to face eternal rivals—the Cougars of Brigham Young University. The Utes and their 5-5 record were mired in a twenty-year bout of mediocrity, and had beaten the hated Cougars only once in the previous 16 years. Fans in sold-out Rice Stadium faintly grasped onto a shred of optimism in hopes of a miracle, but subconsciously prepared to cope with another defeat. On the other side, BYU was at the height of their LaVell Edwards era and 1980s heyday, and even won the National Championship in 1984. A sense of superiority in football affairs within the state of Utah emanated from the parochial school in Provo. Players and fans alike had come to automatically ink a ‘W’ next to ‘University of Utah’ each year the schedule was released. On this November day, big brother was ready to perform another yearly whooping on little brother. To win would not merely salvage another subpar season; it would provide the Utes and their fans with a degree of jubilation unknown to a generation that had never witnessed the feat in their lifetime. A sense of pride in an otherwise painful existence of cheering for Utah Red could be wiped away by somehow defeating the Arrogant Bastards in Blue. Scott Mitchell, better known for torturing Lions and Dolphins fans, led Utah to a mammoth win over BYU in 1988. Scott Mitchell, destined for future mediocrity as an NFL quarterback, and Eddie Johnson, the speedy and compact Ute running back, commanded the Utah wrecking ball that day and sprinted out to an early 21-0 lead. Utah fans at Rice Stadium—and throughout the Salt Lake valley—were in a state of elation while simultaneously hoping to stave off another meltdown. I was only in sixth grade at the time, but I could sense victory in the air from my makeshift seat upon the old, asphalt black-top sloping just beyond Rice Stadium’s north end zone. As Utah continued to pile on the points and tighten their grip on victory, the celebration in the stands began, eventually spilling onto the stadium’s artificial turf as time expired. Utah had won 57-28, conquering the beasts of royal blue and exorcising past demons as the goalposts came crashing to the ground to the cheers of thousands clad in red. Little did we know, exhilaration of this magnitude was set to multiply in the years to come. The 1990s were a renaissance period for Utah Football. Ron McBride took the helm in 1990 and two years later led the Utes to their first bowl berth in nearly 30 years, where they faced Drew Bledsoe and the Washington State Cougars in the Copper Bowl. While they lost 31-28, the appearance was the first step in a long line of bowl appearances soon to come. 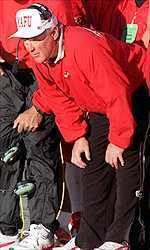 Coach Ron McBride and his famous "MAFU" hat turned the Utah Football program around in the 1990s. 1994 was a banner year for the Utes. McBride and the team—anchored by the great Luther Elliss on the defensive line, solid and steady Mike McCoy at quarterback, and a spry Kevin Dyson at wide receiver—began the season winning its first eight games and cracked into the top ten of the AP rankings (No. 9). However, “Utah tradition” reared its head as the Utes dropped two in a row on the road before going into the annual BYU Holy War. The Utes had beaten BYU 34-31 on Chris Yergensen’s line-drive, wounded-duck 55 yard field goal as time expired in Provo the previous year—the first time Utah had won in enemy territory since 1971. Being at the game myself, I will never forget how quickly the stadium went from being deafeningly loud to absolute silence. One of the best games I’ve ever been to. With revenge on their minds, Brigham Young entered Rice Stadium determined to settle the score. Instead, Utah prevailed in another nail-biter…34-31. The victory sent them to the Freedom Bowl to meet No. 15 Arizona in Anaheim, California. Both teams played tight defense all night. With less than two minutes to play and down 13-10, Utah marched the ball steadily down the field to the Arizona 10 yard line. With only enough time to run one play, quarterback Mike McCoy was pressured out of the pocket and, moving to his right, flung a pass to a streaking Kevin Dyson in the back of the end zone. Six points as time expired; Utah 16, Arizona 13. They finished in the top 10 (No. 10 AP, No. 8 Coaches Poll). This would be Utah’s highest finish in the history of their program, only to be eclipsed 10 years later. 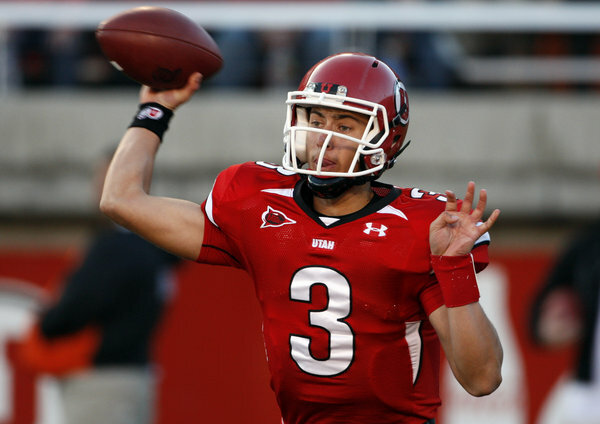 The McBride era carried on into the new millennium having restored respect for Utah Football and laid the foundation for the program to flourish. And flourish they did. Since that time, the University of Utah football program has gradually evolved from mediocrity into regular greatness, or greatness about every other year. Instead of pinning the success solely on beating BYU like we did in the old days, we can take satisfaction on bull-rushing our blue brethren to the side on our way to more profound victories. Victories like finishing them off to seal a perfect season in 2004 and becoming the original BCS Bowl Busters, with the subsequent pounding of Pitt in the Fiesta Bowl. We can also move beyond wishing pain upon the likes of Ty Detmer, Steve Sarkisian and Brandon Doman, to watching our QB Brian Johnson drive the Utes 80 yards to narrowly escape impending doom at the hands of TCU in 2008, and eventually secure a berth in the Sugar Bowl against Alabama. And instead of settling for moral post-season victories like being accepted to the Copper Bowl or losing a close one against USC in the Freedom Bowl in the 1990s, we can hang our hats on the fact that Utah has a nine-game winning streak in bowl games—longest in the nation. We can savor the sweetness of completely dismantling Alabama in the Sugar Bowl to cap off the amazing undefeated 2008 season and relish the fact that the Utes finished No. 2 in the AP polls, even garnering 16 votes for first place. Despite all of this, the question on the table now is whether it is possible to ascend to the highest level of all—National Champion. But before that talk can even begin, one thing stands in the way: a swarm of purple horneds frog from Texas that must be eliminated with extreme prejudice. Until then, I am going to enjoy the lead-up to Saturday’s game, basking in the moment of anticipation for the biggest football game ever played in Rice-Eccles Stadium. My prediction: 28-23. Utah by Five! Go Utes! This entry was posted in Sports and tagged BCS, college football, Horned Frogs, Mountain West, TCU, University of Utah, Utes by Troy Beckman. Bookmark the permalink. Damn, I hate when that happens. Northwestern beating the Lions, I mean. Yeah. OOPS!! To twist the words of Dennis Green’s famous rant: “They (the Utes) *aren’t* who we thought they were!” I guess we still have the chance to go kick Notre Dame while they’re down this week.